If caterpillars were crawling all over my math book, and if I had to solve the caterpillars' problems instead of math problems, I would be so glad. But recently, I discovered that repeating decimals are actually like caterpillars. Caterpillars had been crawling all over my math book and I hadn't noticed! This picture is the structure of the decimal 0.3181818...(7 over 22). The caterpillar's head is the natural number or zero, and there are endless repeating digits that follow. 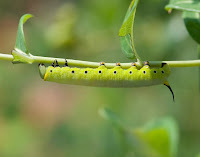 Some caterpillars have extra digits which always come right after the head. There can be one or more extra digits, but I've never seen a decimal with more than three. There are many ways to mark repeating decimals. In Europe, parentheses are used. Dots are common in Asia. I think the dots over the decimals are like the caterpillar's spiracles! Repeating decimals are just never-ending caterpillars. Although you know that '18' repeats in the decimal 0.3181818... you can't reach the end of it! They are so mysterious, like a caterpillar with its tail covered in mist. How wonderful it is to know that you don't know the end? That's why I like all infinite decimals, which include both repeating and non-repeating ones. Non-repeating decimals are very interesting. They are unexpectable, endless caterpillars. Now I'm just starting to learn repeating decimals, and I know that one third is 0.333... I was so curious about this; can non-repeating decimals be changed into fractions? And when I thought about this carefully, the answer popped up in my head. If you are trying to change the non-repeating decimal into a fraction, you would try to decide the denominator first, but you wouldn't be able to decide it! How would you decide the denominator when there are endless digits you can't predict? But there are fractions that are close to non-repeating decimals. For example, 3.142857142857... can be changed into 22/7 so it is close to pi. Still, non-repeating decimals can never be fractions although they might be close. These days I feel like I am opening the doors of new places in the world of math. A lot of places had stayed locked for all these years, and now the area I can reach is slowly expanding(including the world of caterpillars). At times like this, I actually feel like learning new things is the most awesome thing in the world! If I had known every single thing, life wouldn't be as fascinating as the way it is now.